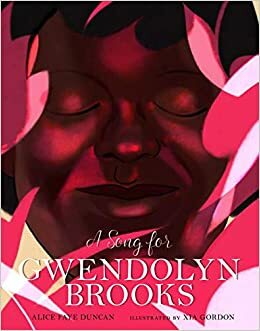 Alice Faye Duncan’s A Song for Gwendolyn Brooks recounts Brooks’ life in carefully crafted verses and introduces readers to Brooks’ own work through sensitively selected poems. Xia Gordon’s evocative images pair well with the text, creating a meditative mood with pictures that at times appear to glow. The brightness of Gordon’s illustrations magnifies the light of Brooks’ words and Duncan’s remarkable tribute to them. Readers are introduced to Brooks as an 8-year-old girl squatting next to a flower as she ponders if it can grow without sunlight. Brooks herself did not have to grow without sunlight, beamed on as she was by adoring parents, a message cleverly woven throughout the book in both image and text. As Brooks matures her parents continue to nourish her literary talent. They shield her from household chores and paid labor. As a result, Brooks “learns to labor for the love of words.” She perfects her drafts, publishes, joins a Black poetry group, enters poetry contests, wins poetry contests, eventually wins a Pulitzer Prize, and it is no longer a small circle of loved ones believing in her genius. Family and poetry are the two foundations of Brooks’ life foregrounded in Duncan’s brilliant and accessible picture book. Importantly, Duncan does not weigh the text down with too much detail. She lets the story breath and encourages children and adults to continue their research. A detailed author’s note as well as a timeline provided at the end of the book offer readers information about Brooks’ commendable community involvement and place her work within the Black Arts Movement. This picture book will be of interest to children who enjoy biographies, histories, and poetry. I highly recommend it for inclusion in school and home libraries. It is a beautifully told story of one of America’s finest poets. *This book will be available January 1, 2019. I received a review copy from the author. ← Multicultural Children’s Book Day!